The illustration above highlights findings from the 2012 National Freshman Attitudes Report, recently released by Noel-Levitz. Along with identifying needs for college freshmen as a whole, the report identifies the specific needs of subpopulations, as shown, to assist institutions with identifying and targeting appropriate educational interventions. Only 38 percent of male freshmen nationally in 2011-2012 indicated their agreement with the statement, “I get a great deal of personal satisfaction from reading” vs. 54 percent of females. Hispanic freshmen indicated that they were more willing to make sacrifices to achieve their educational goals than were freshmen from other racial/ethnic groups, but reported that they had a weaker understanding of the physical sciences. Students from private and public four-year institutions reported the strongest desire and determination to finish college, followed by students from private and public two-year institutions. Freshmen, as a whole, appear to become more tolerant of others’ opinions after half a year of college, with 60 percent agreeing with the statement, “I get along well with people who disagree with my opinion openly” at the beginning of the year vs. 66 to 71 percent at the middle of the year. 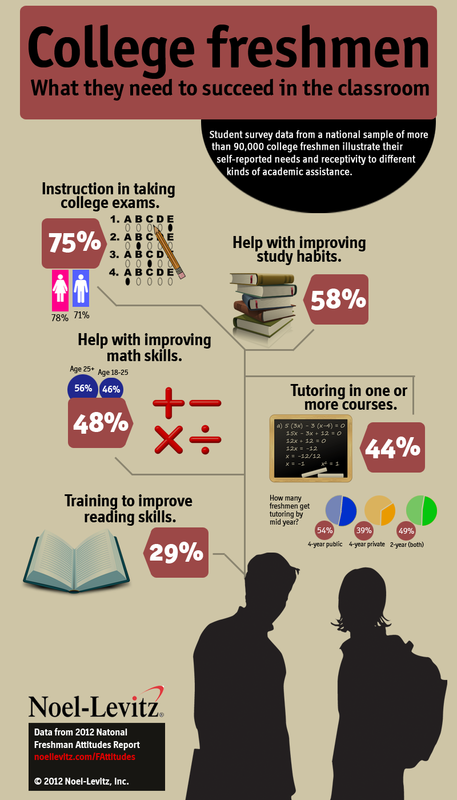 Desire to receive tutoring in one or more courses fell just 3 to 7 percentage points between the beginning of the year compared to the middle of the year, with 32 percent to 46 percent of students continuing to desire this assistance at mid-year. In addition, an examination of changes in freshman attitudes between the beginning vs. the middle of the freshman year showed that many freshmen who expressed interest in receiving assistance with career planning at the beginning of the academic year hadn’t received it yet at mid-year. The findings in this report illustrate the importance of monitoring students’ attitudes and behaviors and following up with appropriate services in order to help more of students complete their coursework and succeed in college. For the complete study, visit www.noellevitz.com/FreshmanReport. The findings on incoming students are based on 94,000 student records from 315 colleges and universities nationwide, with a subset of these records identifying the attitudinal shifts between the beginning vs. the middle of the freshman year. Note: A previous version of this graphic reported incorrect figures on the number of students who received tutoring by mid year. This mistake has been corrected.